Immediately after the 33-year-old Hans Gál made his breakthrough with his opera Die heilige Ente in Düsseldorf in 1923, he began work on a successor, creating a ‘dramatic ballad in three scenes’ to a text by the poet Karl Michael von Levetzow. Das Lied der Nacht was premiered in Breslau (now Polish Wrocław) in 1926 and was soon taken up by several further theatres, before the Nazis’ rise to power sent Gál into exile and his music into obscurity. The opera had lain unperformed for the best part of 90 years until is was dredged up from the archives to be revived this spring by the enterprising Theater Osnabrück in time to mark the 30th anniversary of the composer’s death. It is also being revived in a semi-staging at this year’s Edinburgh Festival, so one might claim that its time has come. It is certainly an interesting work, both musically and dramatically, and while it might not have emerged as a long-lost masterpiece to set alongside the works of Schreker and Zemlinsky from the same decade, there’s enough of substance to make one hope it doesn’t get forgotten again after this initial burst of exposure. Musically, Das Lied impresses with its fluidity more than for striking originality – Gál obviously knew his Strauss and Mahler and steered their languages to his own uses without coming up with ideas that linger long in the mind. At its best, in the dark, gloomy harmonies of the scene with the Abbess for instance, it is powerful and full of resonance, but one longed for something more striking for the ‘Lied’ itself, the mysterious song sung by the ‘Nameless Singer’ that so enraptures the Crown Princess, Lianora – its most potent feature is its harp accompaniment. 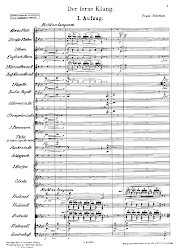 But there’s a rather impressive Act II prelude to compensate – a piece of textural ingenuity and harmonic rapture that would make an attractive concert item in itself – and throughout Gál is particularly adroit at letting his vocal lines cut through the often busy orchestral writing. On the face of it, the story is simple: the orphaned Princess Lianora is refusing to name her husband so that Sicily may gain a king – she is more attracted to the Nameless Singer than to her bullish suitor, Tancred, and would much rather enter her aunt’s convent in any case. But this being the work of a post-Freudian Viennese, the opera is very much an exploration of the psychology of growing up, something drawn out in Mascha Pörzgen’s perceptive staging. With the death of her father, Lianora is catapulted into adulthood before she is ready, with the need to choose a husband to maintain the island’s political stability. She is also a woman in a world where men call the shots – as princess she has obligations that fall under the power of the aged Chancellor and Tancred’s macho strutting. What follows drifts into the world of dreams – is the seductiveness of the Nameless Singer a figment of her unconscious desire for escape? A way of subconsciously avoiding reality by projecting her fantasies on to her favourite gondolier, Ciullo, who turns out to be singer? We are left to ponder what’s real and what imagined – entrances and exits are often ambiguously made from within the scenery and in Act I the ‘Stony’ Abbess emerges as a giant figure from what one presumed to be the Princess’s wardrobe. Watery images abound, too, in keeping with the theme of the Singer’s lament, and add to the sense of subconscious being explored. Gál’s score had sweep and pace in the hands of Osnabrück’s charismatic GMD Andreas Hotz, and while the orchestral playing had sheen and power, it would be good to hear what a really top-notch ensemble could make of this music. Lana Liu was highly effective as Lianora, with focused projection and a communicative way with the words; Susann Vent-Wunderlich as her maid/confidante Hämone was also impressive. Gritt Gnauck, a mezzo familiar from the Detmold ensemble, made an imposing Abbess, bringing a touch of the Klytemnestras to her vocal portrayal, and Ferdinand von Bothmer sung valiantly as the Nameless Singer and Ciullo, with just a hint of insecurity in his tenor at moments of heightened tension. Rhys Jenkins was a solid Tancred, José Gallisa a robust Chancellor and the chorus sang with particular focus and dramatic edge.